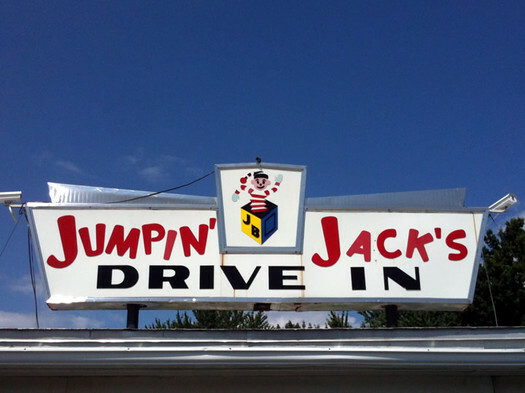 For many in the Capital Region, the arrival of spring is marked by the opening of legendary Scotia car-hop, Jumpin’ Jacks, within sight of the Erie Canalway Trail. Jumpin’ Jacks’ annual opening for the season coincides with the peak of spring fever and a renewed appetite for grilled burgers, hot dogs, and ice cream. Crowds line up for opening day around the end of March and don’t leave until Labor Day, when the drive-in closes for winter. When Jumpin’ Jacks opened in 1952, it only served ice cream, but by 1957, owner Jack Brennan added a charcoal pit, expanding the menu to include the familiar favorites such as the Jackburger, steak sandwiches, hot dogs, and fish fries. In addition to offering food and drinks, Jumpin’ Jacks hosts weekly concerts, fireworks, and water skiing. Check their Facebook page for more information about the entertainment schedule. Erie Canalway Trail travelers can easily access Jumpin’ Jacks with a short half-mile detour across the Western Gateway Bridge (NY-5), which crosses the Mohawk River between Schenectady and Scotia. Jumpin’ Jacks is located directly across from Scotia’s Collins Park.